Anonymous Shirdi Sai Devotee Sai Devotee from USA says: Sripada Rajam Saranam Prapadye!!! Sri Sainatham Saranam Prapadye!!! All glories to my beloved Sadguru Sripada Srivallabha Swamy who is Sri Sai Samartha Himself !!! Before narrating my experience on how Sai Maa (Sripada Swamy) added me in Khichadi Parayan, I request you all to read these lines from Sri Sai Satcharitra chapter 18-19 Baba’s own words about His Guru (He is Sripada Srivallabha Swamy who is none other than Sri Sai Samartha Himself.) "I resorted to My Guru for 12 years. He brought Me up. There was no dearth of food and clothing. He was full of love, He was love incarnate. How can I describe it? He loved Me most. Rare is a Guru like Him. When I looked at Him, He seemed as if He was in deep meditation, and then we both were filled with Bliss. Night and day, I gazed at Him with no thought of hunger and thirst. Without Him, I felt restless. I had no other object to meditate, nor any other thing than My Guru to attend. He was My sole refuge. My mind was always fixed on Him." This Vijaya Dasami 2017 I received a package at my doorstep. It was a beautiful 9 inch brass idol of Sri Sai Baba. I was really happy and welcomed Him in my home by offering an abhishek, puja and the delicacies I made for Vijaya Dashami. 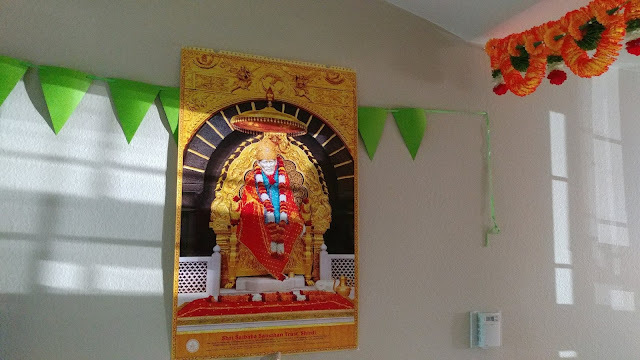 I was really happy as Baba came to us on Dussera and I sent the pictures of puja to my husband who was in office and thanked a lot for the wonderful surprise he gave to me. A couple of hours later he replied back to me saying he did not buy any Baba idol. I was shocked. I checked the order. It was an add-on item with my daughter’s diapers and some coupons were applied for 3 dollars and 2$ was the price charged for that idol. I did not buy the idol neither did my husband. I checked with my elder daughter after returning from school if she added any item in cart by mistake. She denied any such instance. When I checked the price of the idol on the day we received, it was 298$. When we checked with the customer care, they informed us that sometimes prices change and add-on items will be shipped along with orders of 25$. A bill was created on the day it was shipped. How the price was 2$ on that day nobody knew, and how it was added in the cart is a mystery. I’m awestruck with this leela of Baba. However everyone in my family felt that I’m exaggerating a simple order to be a leela. So I described this to one of my neighbors at the bus-stop and asked her if it was a leela or not? She verified the order and said how could it be possible? And she too was convinced that it was Baba’s leela. She told me that she is in Mahaparayan and I should join some group in that parayan. I informed her that I do not feel comfortable in groups and changed the topic. With this I got a friend who is a Baba devotee. We started talking about Baba everyday at the bus stop. A few days later I saw a dream in which Baba was my mother. How can I describe the beauty of Her face (I want to refer Baba as Her, as She was my mother in the dream). She was golden in complexion with bluish-greenish eyes. She was wearing red saree and was looking divine with lot of Sringar like sindoor, kajal, jewellery,etc. Actually I cannot describe the beauty of my Sai Maa’s face. One must look at Her face and enjoy the grace. Coming back to my dream, In my dream we lived in a big mansion and there were many trees with yellow flowers in the garden. Baba (Sai Maa) asked me to play in front of the house while She cooked the food. 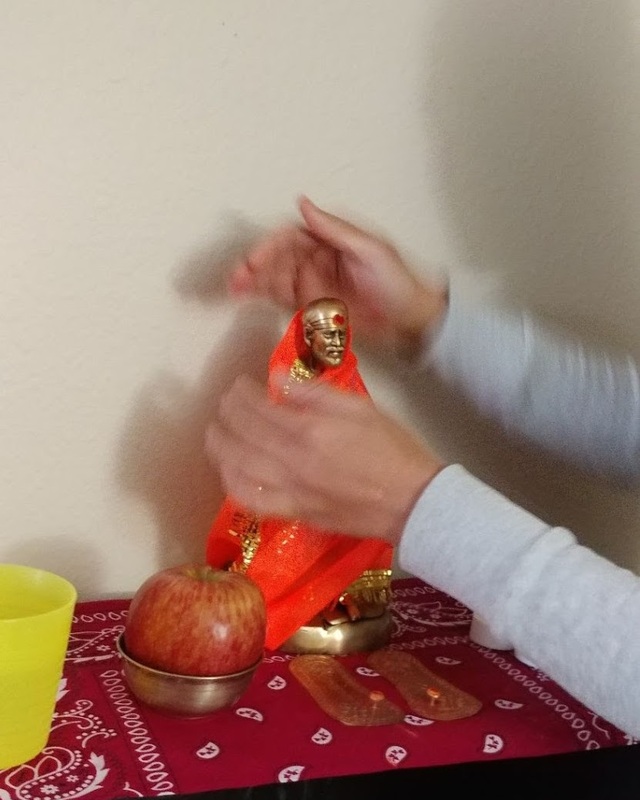 I started playing with my neighbor(Rakhi) and we both made idols with clay while Baba (Sai Maa) was cooking food and watching over us. When the food was ready Baba called us and saw that my hands were full of clay and mud. Then Baba told me while taking that clay out of my hands, “You always make a mess and I have to clean up. Baba makes an idol with the clay in my hands and gives it to Rakhi. Baba starts feeding me khichadi. I ask Her why did She not make kheer? I like kheer as compared to kichadi. Baba with lots of love and affection feeds that khichadi to me saying that Khichadi is good for health and eating sweets daily is not good. After She was done feeding I felt so happy and satisfied that I could not even think of kheer anymore. However, Sai Maa assured me that I would get kheer on a festival day. When I woke up I was so happy that I saw Baba as my mother. In the dream as I saw Baba made a clay idol and gave it to Rakhi, I requested Baba to show me one idol with lots of Sringar just like in my dream so that I can give it to Rakhi. Later that day I found an idol with Sringar just like in my dream. 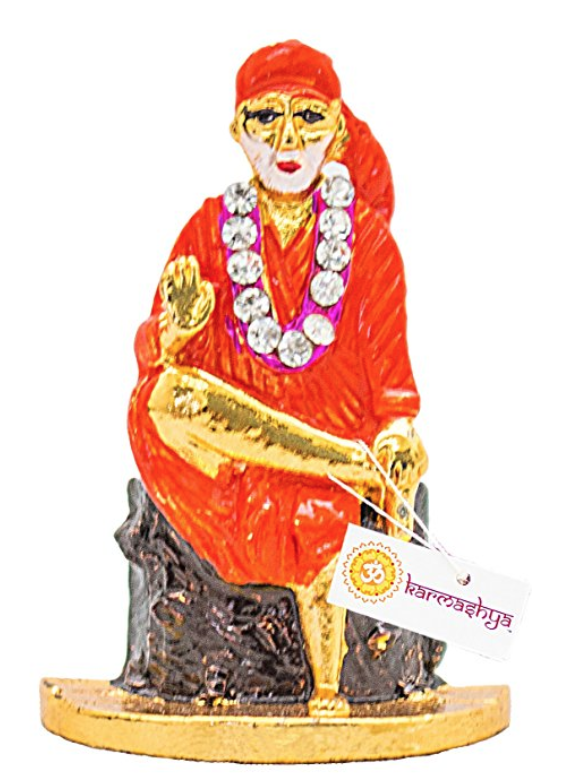 I informed Rakhi about the dream that Baba gave her the Sai Maa idol and I have ordered one and requested her to accept that gift from Sai Maa. When she heard the dream she smiled and said there is a 4 am group in Mahaparayan with Khichadi name and I should join that group. I changed the topic again saying that I’m not comfortable in big groups. I thought she was making fun of me for narrating my dream and I'm quite surprised to hear that there is a Khichadi group. I thought to myself that may be this was a joke, who will make a group with Khichadi name? One day Rakhi invited me over to her house. She showed a photo of Sai Satcharitra cover page, we looked at the photo and started talking about a box kept by Baba's idol in Samadhi Mandir and we were thinking what could be stored in it: Sindoor or betel nuts? Later she gave me Sai Satcharitra by Sterling publications in hindi. I randomly opened 2 pages and in both the pages I saw the words ‘Sai Samarth’ and that Baba is divine mother (chapters 4 and 30). In chapter 4, there is a line describing the beauty of Baba’s face (Unke Sri-Mukh se Sadaiv Amrut Varsha hoti thi). When I read this like it reminded me of a sloka in Soundarya Lahari describing the beauty of Maa Durga’s face. In that sloka it is described that nectar flows on anyone who goes near Maa Durga’s moon like face and they will be drenched in that nectar. I started crying after hearing this line from Sri Sai Satcharitra and I felt embarrassed as I was at Rakhi's house and I have known her only for 4 or 5 weeks. I tried to control my feelings and we continued reading the chapter and when we moved ahead there was another line in that chapter that says even the rocks and pebbles in Shirdi are pious as they touched the lotus feet of Sri Sai Samarth. This line reminded me of Sri Krishna in Srimad Bhagavatam and the Gopikas love for Sri Krishna. I couldn’t read the chapter anymore and I said to Rakhi we can read some other time. Tears were flowing incessantly from my eyes and I felt as if someone was saying “I Love You” in my heart. I cannot describe that feeling. That whole day, all I could think about was that line from Sri Sai Satcharitra “Unke Sri mukh se sadaiv Amrut Varsha Hoti thi”. It was so mesmerizing that even though people were talking to me all I could think was Sai Maa and that line from Sai Satcharitra “ Unke Sri-Mukh se sadaiv amrit varsha hoti thi..”. I fell in love with that line and it kept on going in the back of my mind like a jingle. All that day it was just Sai Maa, me and that line from Satcharitra. I was so immersed that I even forgot to put salt while cooking. That evening Baba had another pleasant surprise planned for us. We got a huge poster of Shirdi Sai Baba Samadhi Mandir in which Baba was wearing a red shawl and there was a golden Sindoor box by Baba’s idol . A friend gave it to us as this calendar was old and it was from Shirdi they did not want to give it away to anybody. When I saw that calendar I could not believe my eyes. Rakhi came over to my house the next day to finish that chapter and she was awestruck too. She said as if Baba is holding a paper and pen in His hands and wrote down all your requirements and sent you the photo (Baba wearing red shawl, sindoor box, Sai Sansthan Logo - Raja Mudrika, Sai Santhan address). I was added in the 9th week of Kichadi Parayan and I was given Chavadi Procession chapter from Sri Sai Satcharitra as my first chapter in Kichadi parayan which is my favorite chapter and everyday I used to read it before going to bed. If it is not Baba, who knows all these details? And my roll number is 27 adding to 9 (Lord Krishna’s number and also important number for Maa Durga and Sai Maa). While reading my chapter for Kichadi parayan 2 kanyakas came over to my place on their own. I also got a blessed coin from Vaishno Devi Shrine as a gift. The biggest blessing of all, that day after Aarti during Mangal Snan of Shirdi Sai Baba ‘Digambara Digambara Sripada Vallabha Digambara’ bhajan was played before Vishnu Sahasranama. 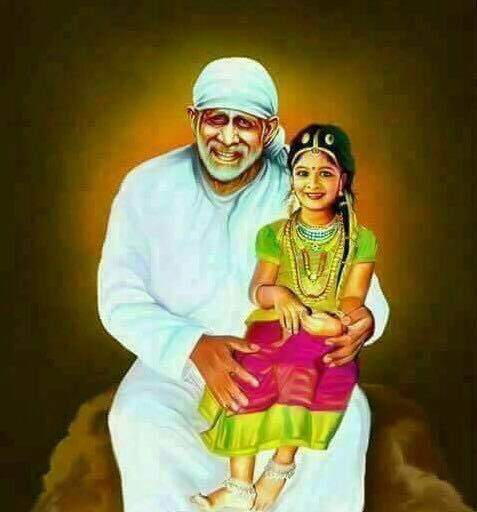 If you remember He is none other than our beloved Sai Maa and my beloved Sripada Swamy (chapter 18-19 Sai Satcharitra). I felt more than happy with these blessings from Sai Sripada Swamy. Sripada Rajam Saranam Prapadye!!! Sripada Rajam Saranam Prapadye!!! Sripada Rajam Saranam Prapadye!!! Love you Sai Maa....please bless everyone with your motherly love and affection. 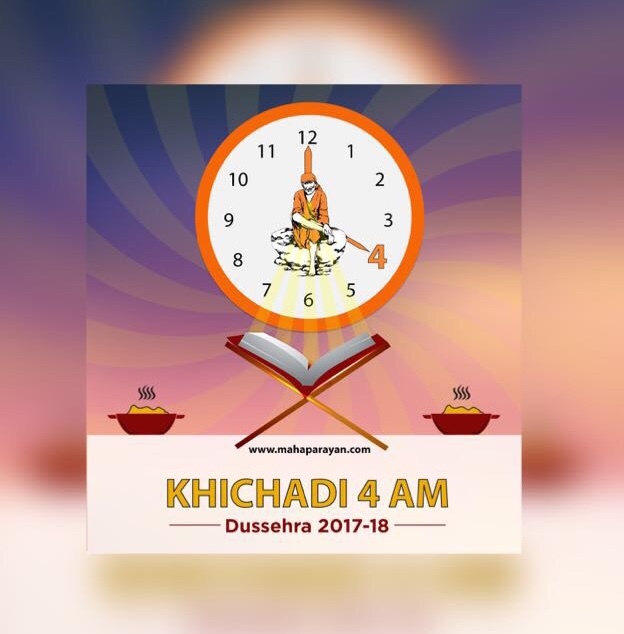 In Khichadi group we have people from all 5 continents reading as per the allocation at the same moment 4am IST that is the Brahma Muhrat. As people from different countries together complete the parayan and hence the name. We also offer Khichadi as bhog and donate it to someone. The Khichadi group itself is full of miracles and believe me every member in it right from Jaya Wahi ji, Hetal di and many more have been added miraculously. Will soon share what miracles and hints Baba showed me for the formation of this Brahma Muhrat Khichadi group. Also many amazing miracles beyond our intellect have taken place in regard to this parayan group. These incidents prove that it is all Baba's doing and guidance and not our manifestations. Thank You Baba for accepting our Khichadi. Love You Sai Maa. Jai Ho Sai. Oh saima what a leela you have played reading itself brought tears and goospumbs. I am lost to imagine the devotees feeling. Thanks for sharing photos. Pooja ji thanks for posting such a wonderful leela still I can't think about anything else and so happily tearful on recollecting. Om sai ram. Really a very blessed experience. Just today itself I came across mahaparayan experience website though I have posted and read experiences in devotees experience website. I was really touched with the experiences U have shared as me too is a strong devotee of Shree Swami Samarth from childhood. Hetal ji had send me invitation in 2017 to join Mahaparayan group but I ignored it as I had doubts in my mind whether it will be possible for me to complete such a great task as we ladies have monthly problems and others. It was the biggest mistake I did in not following baba's order though Sai had chosen me to do this blessed work. Today I just started crying while reading ur experience as baba's leelas are unfathomable and I had just ignored this invitation from Hetal ji. And believe me from October my life has just turned topsy turvy with all the problems which I just cannot bear it anymore.As I am married for past 1 and half year my husbands each and every family member is experiencing health problems right from January 2018. My husband had a dog bite, my father in law was hospitalised, I have met with an accident in March and I am not fully recovered and right now my mother in law is under treatment in hospital. I am fully under stress and want to come out of this biggest calamity.Also I am not getting any success in conceiving.I just want to know if I can join Mahaparayan group now though it's extremely toooo late. If Sai wants he will surely guide me. Plz reply.